Although many travelers visit Peru to explore its pre-Columbian heritage, most travelers passing through the nation’s capital, Lima, prefer to stay in the city’s most modern neighborhood: Miraflores. Travelers choose Miraflores for its proximity to the Pacific Ocean, its vibrant arts and entertainment scene, and its wide range of attractions that appeal to every kind of traveler. When you visit Lima, make sure to check out some of the very best that Miraflores has to offer. Ricardo Palma was a Lima-born writer and thinker who oversaw the country’s National Library from 1883 to 1892. Today, the government has preserved his long-time home as a museum where visitors can see the original furnishings, paintings, documents and art that he cherished during the last years of his life. Currently, the museum is open Monday to Friday from 9:00 to 5:00, but is closed for a lengthy daily lunch from 12:45 until 2:30. Entrance is six soles ($1.75 USD). If your trip to Peru doesn’t include time in Machu Picchu and the Sacred Valley, you can visit this sacred historic site that has been preserved on its original location in the Miraflores neighborhood. It features a typical pyramid crafted from adobe and clay, surrounded by a central square and walls. At press time, Huaca Pucllana is open daily from Wednesday to Monday, and regular entrance fees are twelve soles ($3.50 USD). 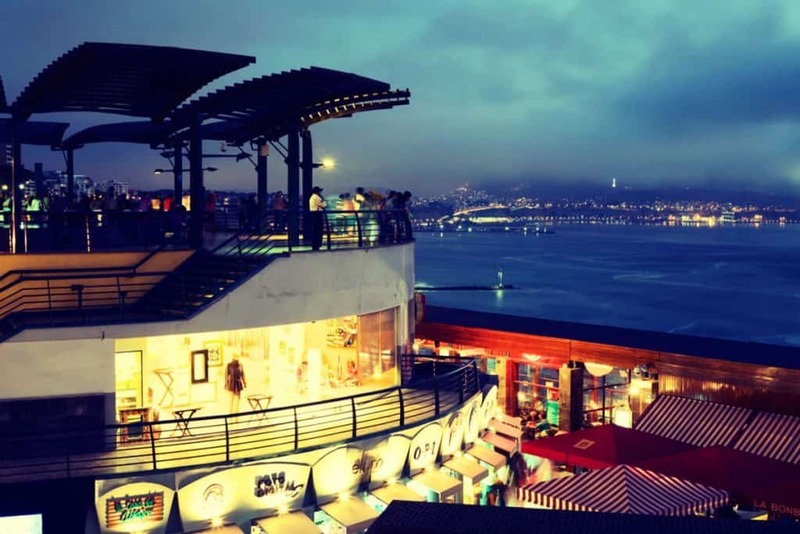 Larcomar is Miraflores’ most famous, and most architecturally interesting, shopping center. It is carved into the seaside cliffs at the south end of Avenida Jose Larco and features several open-air and glass-walled viewing decks offering panoramic views of the sea. Larcomar is home to several upscale restaurants and coffee shops, as well as the best selection of international clothing shops in town. There are eight shops where you can stock up on high-quality athletic and outdoors apparel and equipment before your Inca Trail trek. The malécon is a six-mile stretch of oceanfront parks, walking paths and cycling routes that runs along the Pacific Coast from the artsy Barranco neighborhood in the south all the way to the north end of Miraflores. Active travelers will love going for a jog or bike ride beside the ocean, adventure travelers will want to try paragliding (buy your tickets from the booth at Block 2) and creative types will want to take in the many different sculptures erected along the walkways. Also known as the “Park of Love”, Parque del Amor is Lima’s most romantic park. At the center of the park is Victor Delfin’s gigantic red statue El Beso (The Kiss), shown above, that features two loves entangled, horizontally, in a kiss. The park also has some of the best sunset views in the city, making it the perfect place to snuggle up with the person you love. Situated in central Miraflores, away from the ocean, Parque Kennedy has become a controversial tourist attraction that often pits frustrated locals against wide-eyed tourists. The park was named after John F. Kennedy and is frequented by buskers, shoe shiners and the elderly. It is also frequented by the one hundred (or more) stray cats who call the park home. There are cats on the grass, cats on the benches and even cats in the trees. While some consider the cats to be a public health hazard, other consider them an adorable addition to the neighborhood. You’ll have to visit and decide for yourself! Whether you want to explore the history of Lima, have an active holiday or simply relax with a cup of hot chocolate while you pet a stray cat, Miraflores has something for you. It is also well-connected by bus rapid transit (BRT) to the historic center of Lima, so you can see the very best of old and new Peru during your stay.